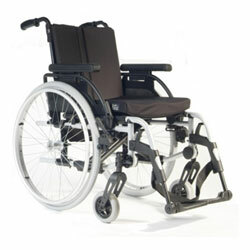 The Quickie Rubix wheelchair is the ideal choice if you have a condition that will change over the years. The wheelchair come with adjustable parts as standard, meaning they can be easily adjusted Armrest length and height, seat height, seat depth, seat angle, footplate angle, centre of gravity, backrest height and tension. For the larger, heavier users the Quickie® Rubix comes in an XL version. With three seat width options - 52cm, 56cm and 60cm, four seat depth options – 41cm, 43.5cm, 46cm and even 48.5cm, footboard and stabiliser bar for increased rigidity and support and all key parts are interchangeable. Sizes: 16" 18" 20" 22" 24"